“Among other nonsense (as well as certain justified criticisms), I hear that Gaivazovsky paints too quickly and sloppily. His works are more like stage sets than paintings, they say. 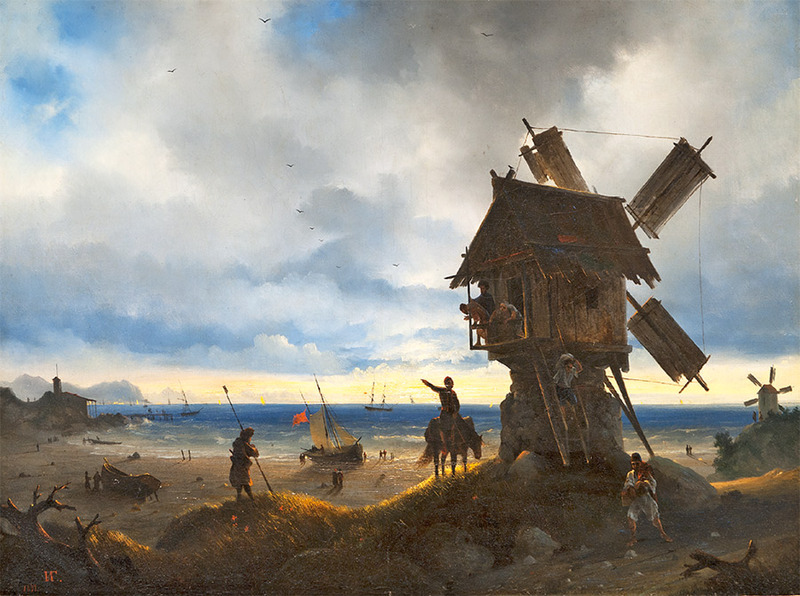 I no longer have the energy to refute these accusations; I can only remark sorrowfully that ‘at least the stage sets are delightful, you must concur.’” In such terms, without hiding his sincere chagrin, the well-known patron of the arts Alexei Tomilov wrote in 1842 to the marine painter Ivan Aivazovsky, who was, by then, acquiring a reputation in Europe. 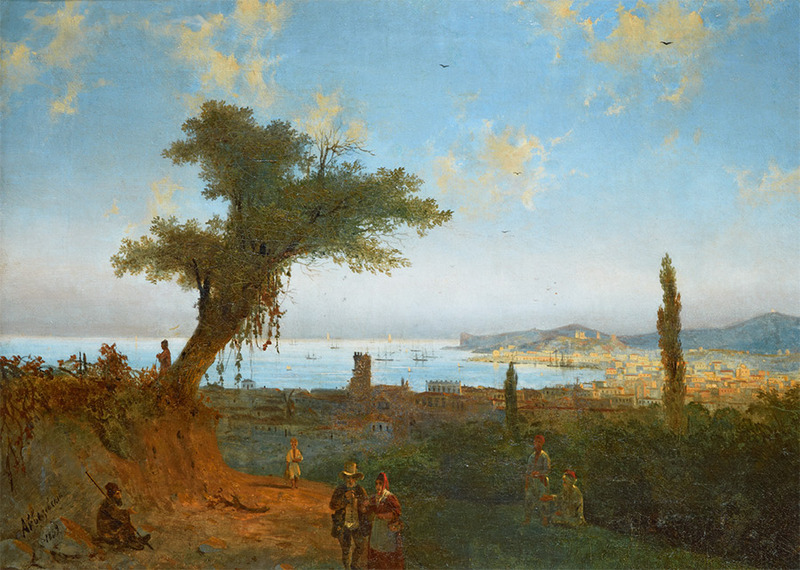 Tomilov’s words referred to those aspects of Aivazovsky's art that were shortly to see him labelled as a salon painter; in the years that followed, this view became increasingly accepted. Tomilov, however, found this verdict upsetting: well-versed in aesthetic theory and in questions concerning the technical expression of form, the critic saw special meaning in Aivazovsky's works. The correspondence between the two men during the artist's time at the Imperial Academy of Arts and on his subsequent journey to Europe, when his painterly style was being formed, clearly shows the lively interest that the art connoisseur took in the work of the young artist. As well as showing Aivazovsky's relentless passion for studying nature and seeking his own original language, these fascinating letters also reveal new facets of the artist's personality. To some degree, Tomilov's universal ideas on form, colour and composition all became embedded in the marine painter's creative methods, in many ways determining the direction of his development. In the first half of the 19th century, Alexei Tomilov was primarily known for his art collection, one which featured the work of both well-known Western European masters and prominent Russian painters. Specialists consider Tomilov to be the first collector of graphic art by his contemporaries, among whom were artists such as Orest Kiprensky, Alexander Orlovsky, Vladimir Borovikovsky and Alexei Venetsianov. Tomilov's Uspenskoye estate in Staraya Ladoga was a comfortable refuge for artists seeking inspiration, its creative atmosphere and lively debates invariably providing guidance and food for thought for Tomilov's many guests. 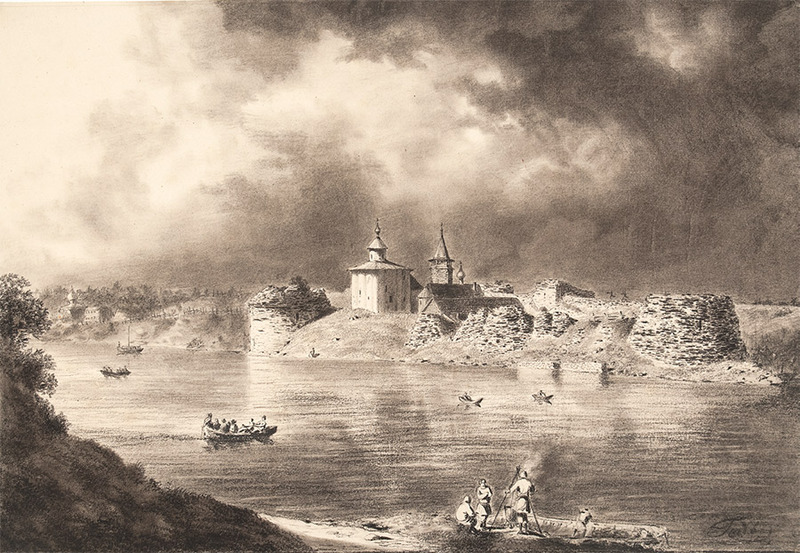 Spending his summer months in Uspenskoye as a student, Aivazovsky created several graphic works there, including his “View of Staraya Ladoga” (1835, Russian Museum) and “Peasant Yard” (mid-1830s, Tretyakov Gallery). The young artist also presented Tomilov with his drawing on biblical themes, “The Betrayal of Judas” (1834, Russian Museum), created in one of his classes at the Academy: the gift inscription can be seen on the reverse of the work. In reading Aivazovsky's elegant letter, filled as it is with sincere gratitude, one might fail to take note of a key detail: the meaning with which Aivazovsky invests the words “close concern”. The writer is hinting that Tomilov plays a unique role in his life. The surviving correspondence between Aivazovsky and Tomilov proves that the social protection which the art connoisseur offered to the young artist was not the main premise on which their relationship was based. Sensitive to the aesthetic aspect of art, Tomilov was interested in the creation of new art forms. 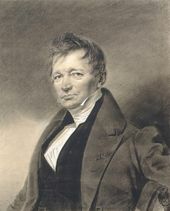 The free, enlightened nature of his views is also evident in the fact that he was, in the 1810s, a member of one of the better-known Masonic lodges, “United Friends”. Other famous members of the lodge included the poet Alexander Griboyedov; Pushkin's friend, the philosopher Pyotr Chaadayev; and one of the future leaders of the Decembrists, Pavel Pestel. 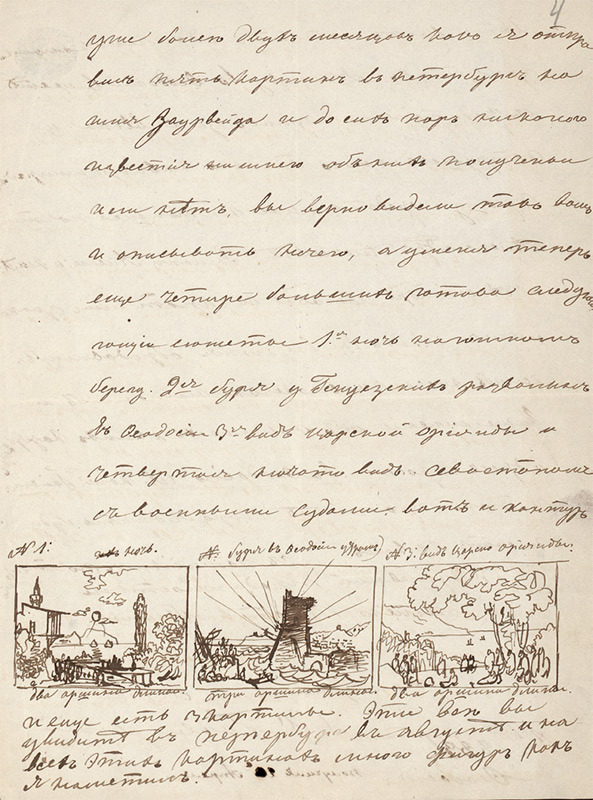 Writing about the artistic atmosphere that Tomilov nurtured at his Staraya Ladoga estate, the art historian Tatyana Alexeyeva, who edited the critic's manuscript “Thoughts on Painting”, justly remarks that he “was one of those people whose inner world speaks volumes of the spiritual standards of an era.” It is worth noting that, although it mainly contains his views on the creative process, the art historian Valery Turchin has called Tomilov's “Thoughts on Painting” manuscript pro-Masonic. 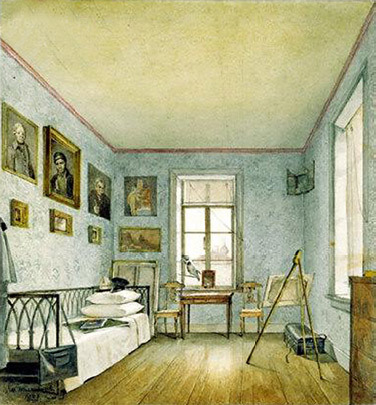 Well-versed in 18th and 19th century philosophic aesthetics, Tomilov had an important influence on the artists who visited him at his home and on his estate. 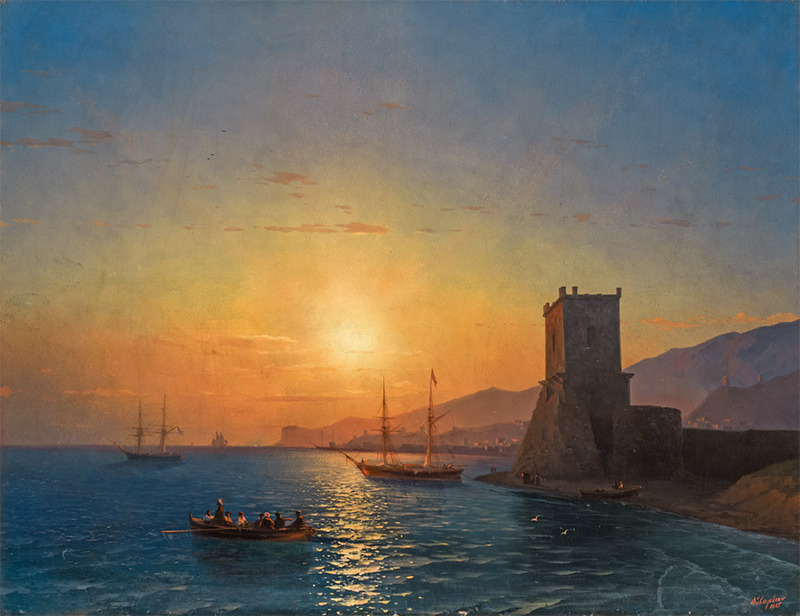 Having supported many of the finest Russian artists of the first half of the 19th century, Tomilov proceeded to extend his attention to the new generation, to which the young Aivazovsky belonged. Tomilov's words - “make more sketches: bushes, trees, cliffs, waves, ships etc.” - should not be interpreted as a call to work exclusively from nature, or, indeed, to attempt to copy nature in every detail; the critic was certainly not referring to realist methods. 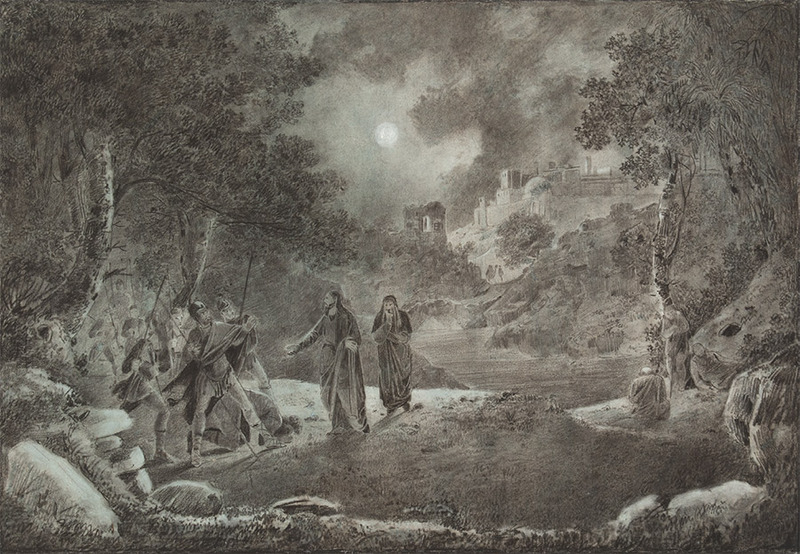 It was, it seems, important for him to convey to the young painter his idea around the creation of integral artistic images brought into being through the imagination, yet rendered in accordance with the dictates of classical composition. This division from the author of “Thoughts on Painting” is founded on the same sensual basis that should, Tomilov felt, be present in any true work of art. For this reason, Tomilov himself gave preference to the second approach, which could be likened to the methods used by Rembrandt or Rubens. 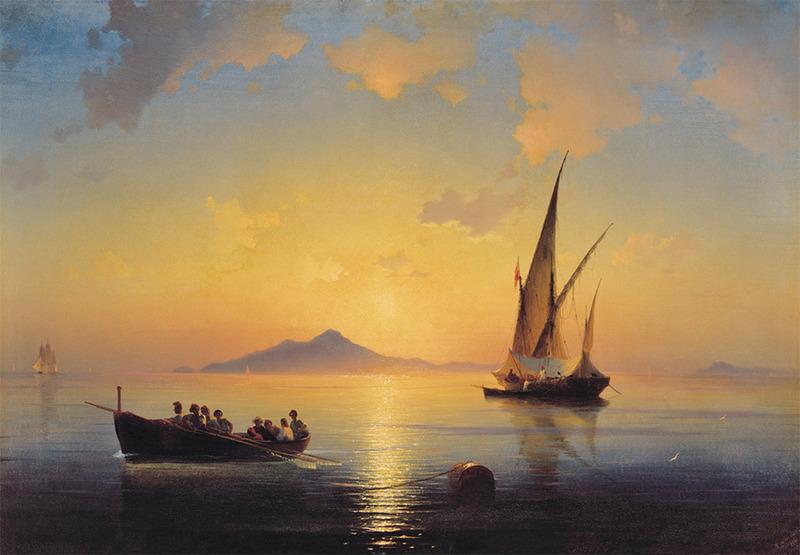 It is clear that, with their bright, highly contrasting hues, many of Aivazovsky's works can be seen as expressions of the ideas of Romanticism, which supposes an absolute “feeling in” on the part of the artist, and of the viewer. Aivazovsky uses the second approach only for those works that require a striking touch which does not correspond to natural hues. The very subjects of his “disaster” paintings such as “The Ninth Wave” (1850, Russian Museum) or “Storm over Yevpatoria” (1861, Tsarskoye Selo Museum-Reserve) seem to demand heightened, vivid colour, which Aivazovsky creates with the aid of prevailing warm red and yellow tones. 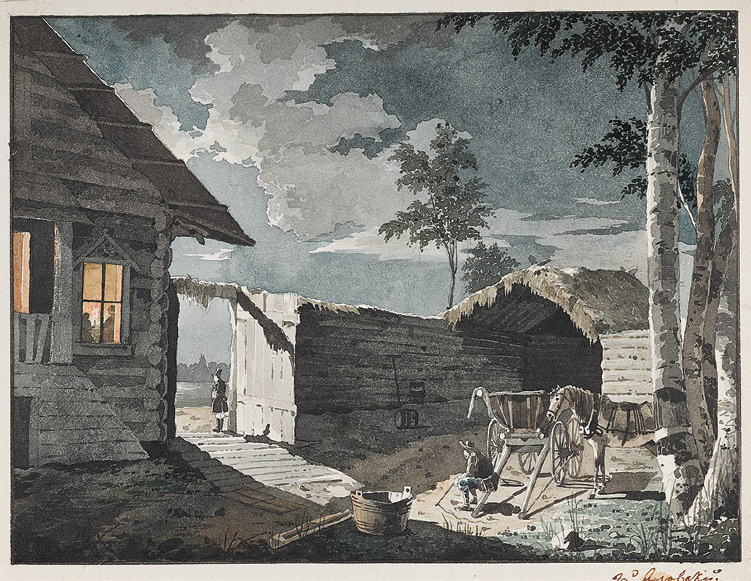 This approach was also seen as appropriate for works portraying times of the day and, thus, conveying a certain theosophical mood of pondering the secrets of the Universe. To Ivan Aivazovsky, the student of the Imperial Academy of Arts still discovering his creative talent, Alexei Tomilov was more than a benefactor. 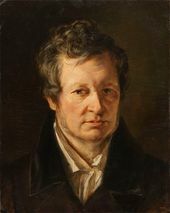 The art critic was able to offer the young painter the same sensitive guidance and support that he had provided to many famous masters of the first half of the 19th century. 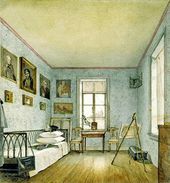 It is evident that the ideas contained in his “Thoughts on Painting”, repeatedly voiced to Aivazovsky during the two men's many encounters, were also expounded in his letters to the artist that survive today. 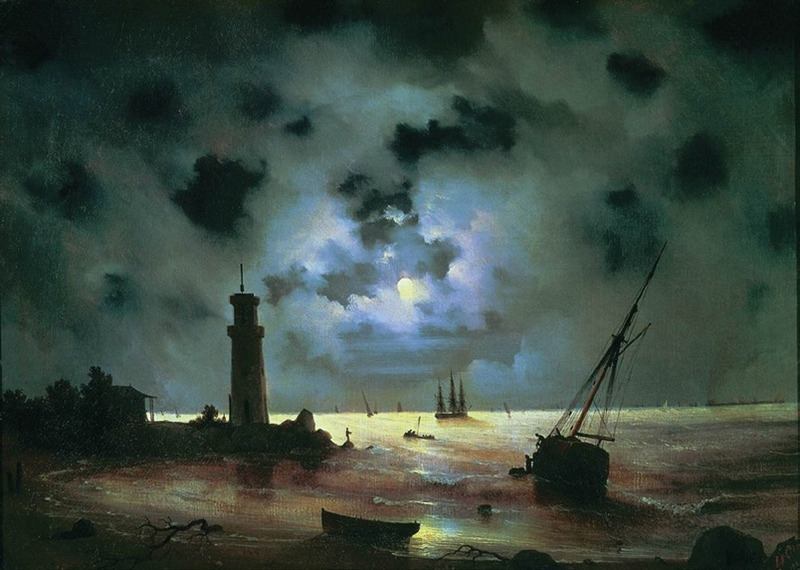 Whilst it is hard precisely to evaluate the influence of these ideas on the great marine painter's creative development, to deny their importance for Aivazovsky would certainly be a mistake. 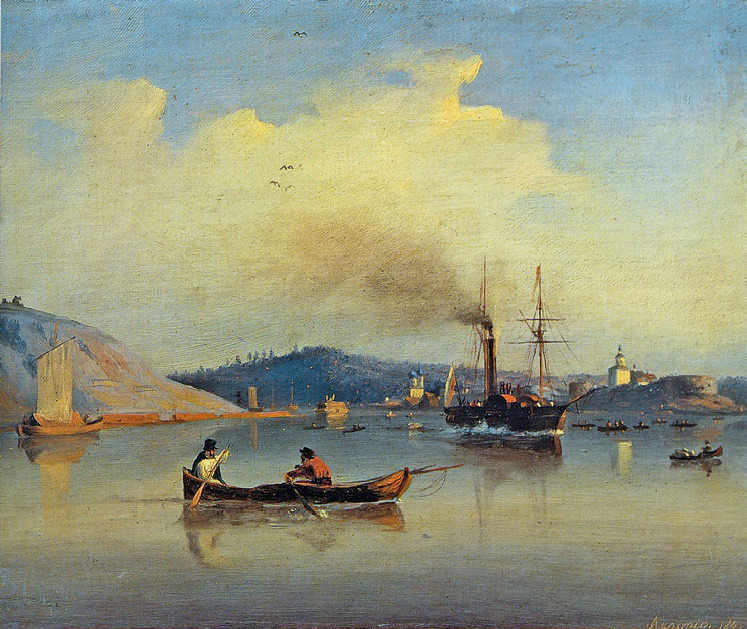 This influence is clearly evident not only in the ideas of Aivazovsky, so similar in many respects to those of Tomilov, but also in the main mystery associated with the “last Romantic” of Russian landscape painting. Despite their striking nature, Aivazovsky's canvases are systematic and methodical in a way reminiscent of pre-romantic tradition. Based on the ideas of 18th century philosophers and theoreticians, the aesthetic theory put forward by Tomilov in his “Thoughts on Painting” naturally encouraged the young Aivazovsky to seek to return to the “roots” with a pre-romantic approach to creating works of art. As Nikolai Masalin writes: “He does not enquire, what is the sublime? He does not question its nature. He does not seek to find its roots: the viewer has no need for this. 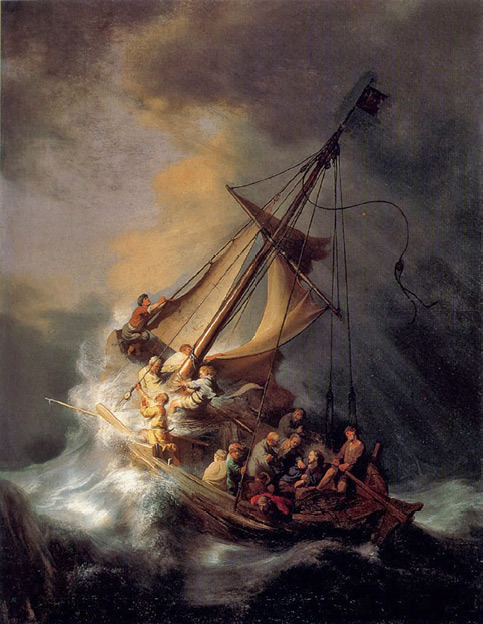 Aivazovsky informs his viewer that the sublime exists; he shows the viewer how it looks; his narrative is clear and detailed.” The “feeling of the sublime” that Aivazovsky experienced in his contact with nature, together with the classic tradition that underpinned his painterly memory, provided the main foundations for the artist's work. 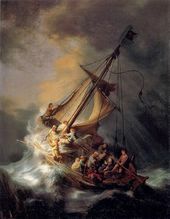 This is perhaps why it could indeed be difficult for the rational viewer, one born out of the Enlightenment, to appreciate Aivazovsky's work. 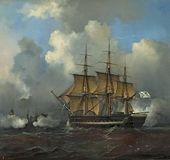 For those with such allegiances, ships disappearing into a thin veil of morning mist could indeed seldom be anything but “delightful stage sets”. 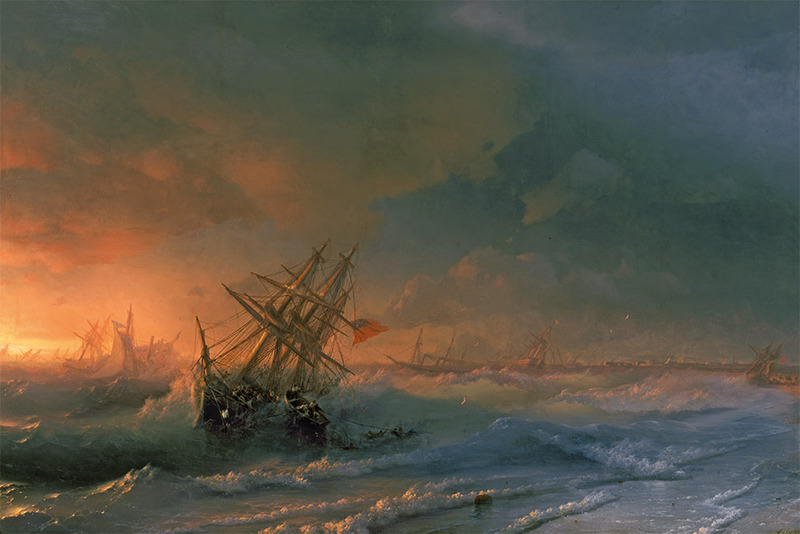 Prior to 1846, Ivan Aivazovsky was frequently referred to as “Gaivazovsky”. 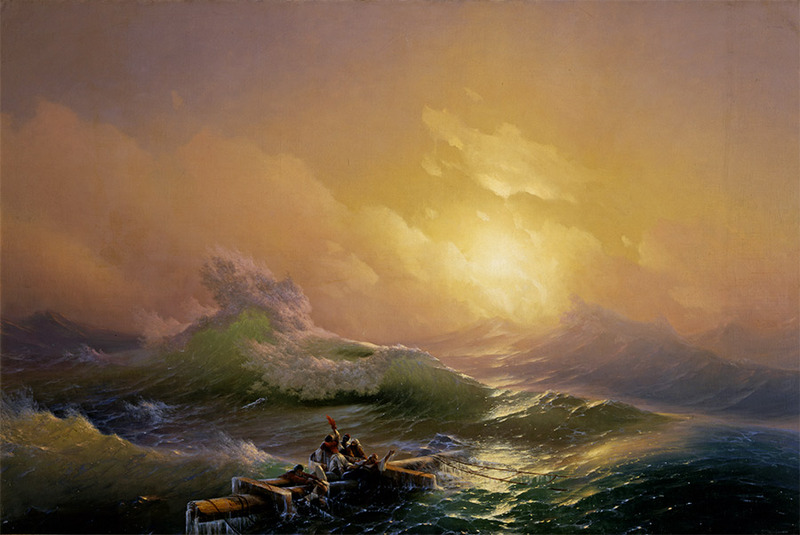 The artist did not begin signing his works “Aivazovsky” until 1840. Russian State Historical Archive, collection 1086, inventory 1, file 117, folio 6. Russian State Historical Archive, collection 1086, inventory 1, file 117; file 130. Published in “I.K. Aivazovsky - Documents and Materials”. Yerevan, Hayastan, 1967. Solomatina, N. ‘Drawings and Watercolours from the Tomilov-Schwarz Collection’ // “The Tomilov-Schwarz Collection” exhibition catalogue. St. Petersburg, Palace Editions, 2015. P. 57. Notes of the Odessa Society of the Lovers of Antiquities // V! Geiman. “Obituary of Ivan Aivazovsky”. 1900. P. 3. Bulgakov, F.I. “Ivan Aivazovsky and His Works”. St. Petersburg, 1901. P. 9. Russian State Historical Archive, collection 1086, inventory 1, file 130, folios 1-2. 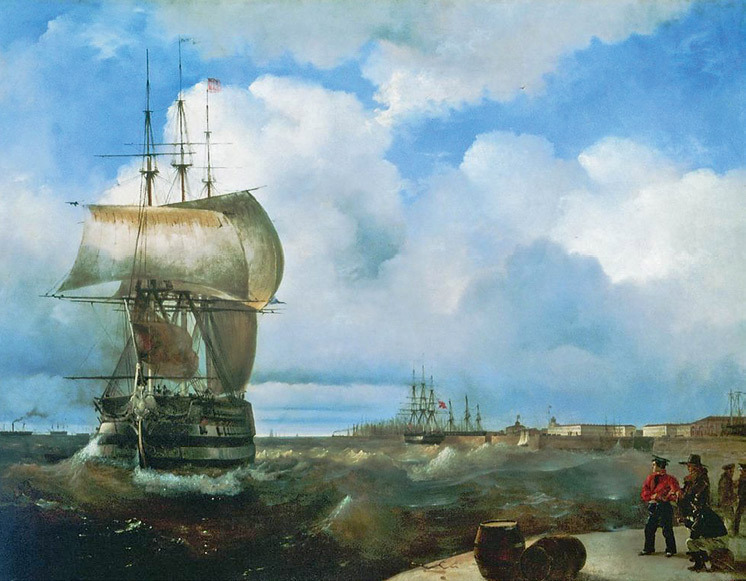 “Ivan Konstantinovich Aivazovsky and His Forty Two Years of Artistic Activity. 1836-1878”. Chapters I-III // “Russkaya Starina” (Old Times in Russia). April 1878. St. Petersburg. P. 669. Russian State Historical Archive, collection 1086, inventory 1, file 130, folio 7 (verso). Russian State Historical Archive, collection 1086, inventory 1, file 130, folio 5. Alexeyeva, TV Alexei Tomilov’s “Thoughts on Painting”’ // “Studies and Finds”. Moscow, 1976. P. 117. Hereinafter - Alexeyeva. Turchin, VS. ‘Images of Freemasonry in the Iconography of Russian Art of the First Half of the 19th Century’ // “The 19th Century: Integrity and Process. Questions Concerning the Interaction of the Arts”. Collection of articles/State Institute of Art Studies of the Russian Ministry of Culture, Tretyakov Gallery. Moscow, 2002. P. 66. Hereinafter - Turchin. Vasily Ivanovich Grigorovich (1786-1865) was a Russian art historian. In 1828 he became Conference Secretary at the Imperial Academy of Arts. Russian State Historical Archive, collection 1086, inventory 1, file 117, folio 2. Russian State Historical Archive, collection 1086, inventory 1, file 117, folio 2 (verso). Geiman, V! ‘Ivan Konstantinovich Aivazovsky (On the Centenary of His Birth)’ // ITUAK (News of the Tavrida Academic Archives Commission), no. 55, 1918, Simferopol. P. 196. Hereinafter - Geiman. Russian State Historical Archive, collection 1086, inventory 1, file 117, folios 3 (verso)-4. Russian State Historical Archive, collection 1086, inventory 1, file 117, folio 3 (verso). 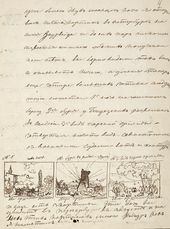 Russian State Historical Archive, collection 1086, inventory 1, file 117, folio 6 (verso). 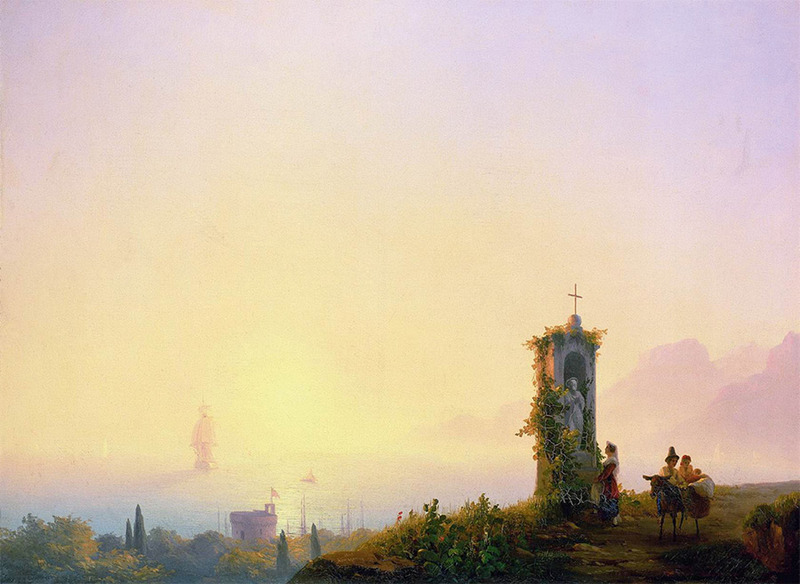 Masalin, N. ‘The Art of Ivan Aivazovsky and the Early Romantic Concept of the Sublime’ // “Voprosy Iskusstvoznaniya” (Questions of Art History Studies), 4/93. P. 90.